Artist David Sandlin had only been in New York City for a couple of years when he was plastering downtown Manhattan’s concrete building facades with graphic silkscreened posters to promote his solo exhibition at Kwok Gallery in 1982. But at that point he’d already won five hundred bucks in an art contest, played a role in a wholly rambunctious countercultural art collective, and worked as a studio hand for Robert Rauschenberg, Buckminster Fuller, and others. 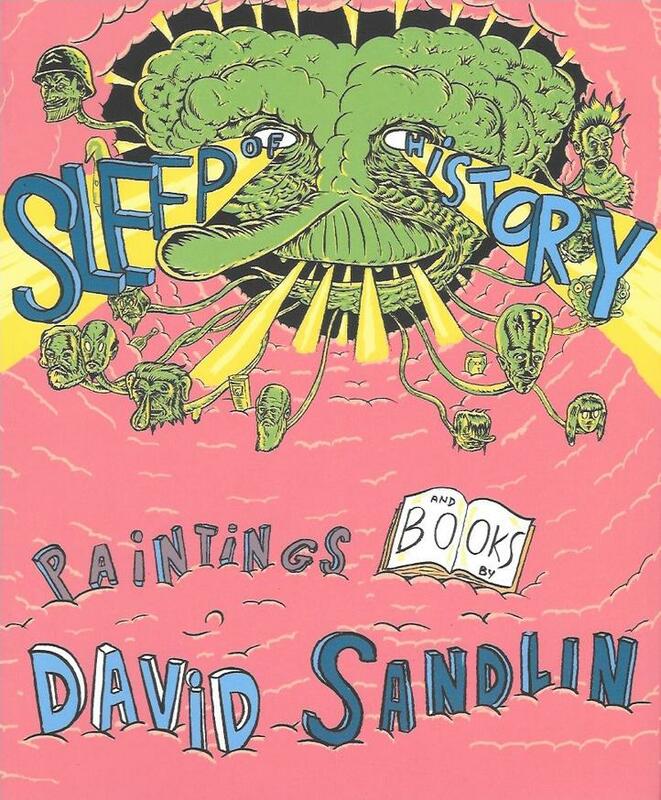 Sandlin’s father moved the family to Alabama from their native Ireland when David was a teenager, and he found himself heading east in 1980, during a particularly fertile era for street art on the Lower East Side. Keith Haring’s chalk drawings were visible to passersby on the subway platforms underground, while elevated subway trains decorated by crews of Bronx graffiti writers rolled over the Williamsburg Bridge. 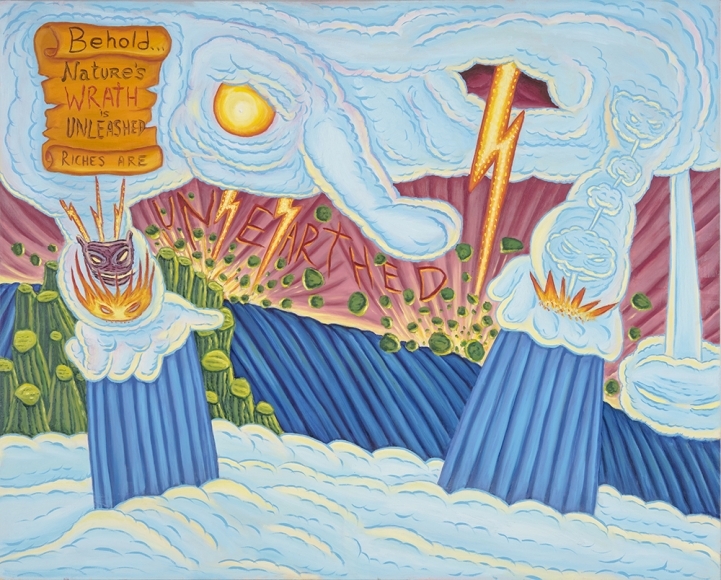 People picked up on Sandlin’s prints and paintings, and soon, the angry political art he was showing at Gracie Mansion’s gallery on St. Mark’s Place targeted the gang of evangelicals who had by then taken up residence on Pennsylvania Avenue. 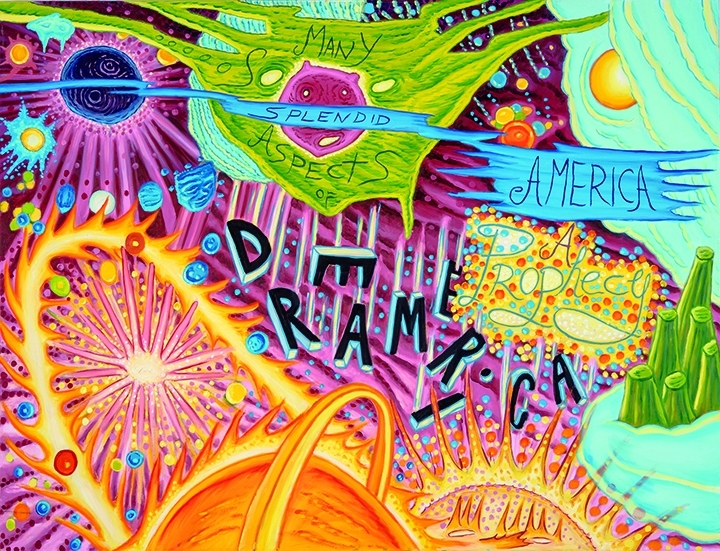 Citing influences he found in comics by Will Eisner and Jack Kirby—witness the characters from Walt Kelly strips in his big oil paintings or a channeling of the bewitching cosmic backdrops of early “Silver Surfer” pages in a richly colored silkscreened print that Sleep of History reproduces called “In the Beginning”—Sandlin’s work soon ran in the visionary avant-garde art anthology RAW, which was launched in 1980 by artists-editors Françoise Mouly and Art Spiegelman. RAW included strips from Richard McGuire, Charles Burns, and more. In the new book—a 200-page softcover catalog of a 2017 show at the Abroms-Engel Institute for the Visual Arts that features essays from Harper and curator John Fields—Sandlin’s carnivalesque comics, a glimpse of a graphic novel in progress, and other narrative art mingle with grandiose and surreal, politically charged oil paintings. Some of these paintings are on display until October 13 at a compact but resonant exhibition called “Age of Enfrightenment” at Owen James Gallery in Manhattan. In Sleep of History‘s “An Alphabetical Ballad of Carnality” or 1997’s “Safe, Secure, in God’s Arms,” punk portrayals of gleaming white male preachers are suffused with guns, bibles, and pronounced sexual imagery, as bulbous nudes or wholly recognizable, underwear-clad conservative politicians prance in moss-covered backgrounds. Confederate flags haunt modern America in an acrylic work for which the book is named, while Richard Nixon appears to feed upon the corpse of Abraham Lincoln, algae-toned and monstrous. As history repeats itself, the klansmen, army infantry, and wooden crosses—each an integral component or at least symbolic of the policies and regularly broadcast sentiments of the Trump administration—share real estate in Sandlin’s pointed and nightmarish montages, new and old. 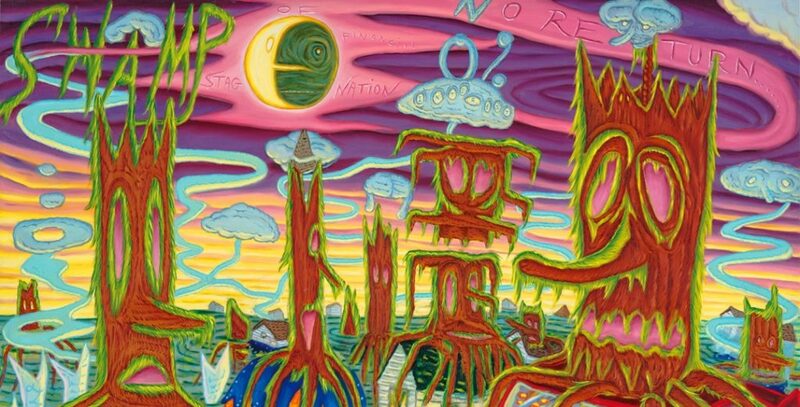 The paintings are littered with pop culture allusions but look back also at the evangelical radio shows of Sandlin’s youth in Alabama as often as they do the abhorrent condition of contemporary American politics. Recent leaders stationed across the aisle aren’t safe either, as President Obama presides over a graphic air and sea battlefield scene of firebombs and destruction in “Make the Wind Lie Still.” War-mongering knows no party lines. If the pudgy-faced depictions of reckless fundamentalist Christian Mike Pence at Owen James Gallery this month happen to radiate artificiality, specifically in the Vice President’s spotless complexion and the honeyed glow against the tree-bark framing of “Will O’ the Wisp” (named for the lanterns of English folklore), it’s of course intentional. When it came time to share a ticket for the highest office in the land with a documented sexual predator, Pence relegated his church-bred principles to footnote status, although not before reportedly masquerading for five minutes, as the GOP always does, as a figure governed by decency and morality. Each of Sandlin’s new paintings of Trump and company communicate that menace and hypocrisy well, and the renderings of the Commander-in-Chief as a mop-haired, bloated grotesque, whose incoherent missives leak out of every orifice, are harrowing in person. But while the future looks absolutely dismal for us, the good news for Sandlin—whose propensity for political satire gained steam with paintings of Ronald Reagan almost 40 years ago—is that he will never run out of targets. Images © 2018 David Sandlin via Owen James Gallery. Sleep of History is published by the Abroms-Engel Institute for the Visual Arts. It’s available at Desert Island in Brooklyn. I got word of the Owen James show at Desert Island’s plentiful Instagram account.